During Meg Ashburton’s single London Season she had been a wallflower ignored by all of Society. Except for one man. Lord Sedgewick had danced with her, and she had secretly fallen in love with him. Now, six years later, a carriage accident drops the injured Lord Sedgewick practically on her doorstep. Hoping for a second chance at love with him, Meg instead finds her world turned upside-down. As I was planning out this story, I knew it had to end not only with a duel, but with a duel that goes wrong. I wanted my hero’s gun to have been tampered with in some way so that when fired it would likely kill him, either by exploding or backfiring or some such thing. Since I don’t know anything about guns, especially 1814 flintlock dueling pistols, I didn’t have a clue what sort of tampering might be required to put my boy in danger. Luckily, I lived in a town that was also home to Butterfields (now Bonhams), an auction gallery that happened to be one of the premier purveyors of antique arms and armor in the world. I spoke with two of the gun experts there, and together they came up with the precise sort of tampering required for the gun, if fired, to blow up in my hero’s face. Many thanks to the experts at Butterfields. Romantic Times BOOKclub awards 4 ½ stars to An Affair of Honor. Their review says: "Ms. Hern exquisitely develops her appealing love story with richly textured characterizations and impeccable craftsmanship." Rakehell.com says: "I couldn't put it down. I loved this book, and anyone who can't find a copy is missing out. An absolutely DON'T MISS read." Under the Covers Book Reviews says: "Candice Hern has penned a charmer that engages the reader from the first sentence. Her characters are people the reader would love to know -- or be -- and plot and tension just keep building and building. An Affair Of Honor is the model Regency; a delightful, heart-warming read; and a definite keeper." An Affair of Honor was a finalist for the CRW Award of Excellence. 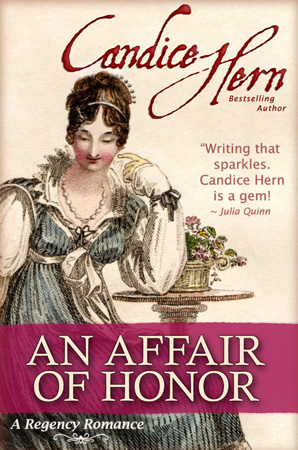 An Affair of Honor was nominated as Best Regency by Romance Readers Anonymous. Viscount Sedgewick was dead. He was sure of it. He had a vague recollection of the sensation of flying as he had been thrown from his curricle. Now, he seemed to be floating in darkness. He could see nothing, hear nothing, feel … nothing. Good Lord, he must have killed himself! How the devil had he managed something so stupid? He had been on his way to … where? He could not focus his thoughts clearly enough to remember. Was this what happened when you died? Funny. Though he had never actually given it much thought, he had assumed it would be different, somehow—that everything that had in life been a puzzle would suddenly become clear, that a lifetime of forgotten memories would be presented to his mind’s eye with the clarity and detail of printed pages in a book. He would never have predicted that thoughts and ideas would become fuzzy and disjointed, as elusive as dandelion seeds scattered in the wind, until they were completely out of reach and could no longer be grasped at all. Perhaps he had been wrong about death. Perhaps his mind—all he seemed to have left now, no longer having any sensation of a body—would simply fade away until there were no more thoughts at all, nothing whatsoever remaining of Colin Herriot, Viscount Sedgewick, body or mind. No! I am not ready to go! He struggled to hang on to this one conviction, perhaps his last remaining conscious thought. I am not ready. And all of a sudden, in an almost blinding flash, everything changed. Where moments ago—was it only moments?—there had been nothing, now there was pain. Excruciating pain. Where before Sedgewick had been conscious of no physical sensation whatsoever, he now became aware of his body for the first time, and as far as he could tell, every single part of it hurt. But no, he couldn’t be there, could he? He had not done anything that terrible in his lifetime. Or had he? Oh, good Lord. His head, or at least the place where he knew his head to have once been, felt as though it were on fire, so the possibility that he was in fact there had to be faced. His poor dead soul was being tortured for his sins. But why? To be sure, he had led a somewhat capricious life during his thirty-six years. He had enjoyed himself, but what was the harm in that? There had been all those women, of course, but they had all been willing, and often eager, partners. Sedge couldn’t help it if they found him irresistible. Besides, he had never knowingly hurt any of them, and they had in most cases remained friends long after the end of an affair. Of course, their husbands might have a complaint or two against him; but even that seemed a bit far-fetched, for, after all, how many of those gentlemen could lay claim to any sort of faithfulness? So, then, how the hell had he ended up in … well… hell? A sharp stab of pain pounded through Sedgewick’s head, as if in reply. Dammit, what had gone wrong? How was it he was being judged so harshly? He had gambled, too, of course, but not to excess, and had never been, as far as he knew, the cause of anyone’s ruin. He was prone to be lazy at times, it was true, but for the most part had been conscientious in his duties and obligations. He kept an eye on his investments and tended his estates. Well, to be perfectly honest, he hired excellent solicitors and stewards who ensured that his estates and tenants were well tended, but it amounted to the same thing. He remained close and attentive to his widowed mother and sister, was a loyal friend to many, and generous with his time and money. Damnation! He did not deserve this. By all accounts he should have ended up someplace altogether different. Some place pleasant and painless and beautiful, with angels strumming harps and singing in perfect harmony. By God, it wasn’t fair. It simply was not fair. Before he could formulate another thought, things got worse. It felt as though his brain had slammed up against the side of his skull. His head seemed to have moved to an awkward angle. Or been moved. Ohhhhh. The sound of his own groan echoed in Sedge’s head like a clap of thunder. Could a dead person groan? For that matter, could a dead person feel pain like the pounding of Thor’s hammer in his head? Thank God he had never committed any truly heinous acts in his lifetime, if this was the punishment handed down for such trivial and common sins as his own. His present agony was soon increased by the weird, muffled sound of voices rumbling in his head. Incomprehensible and yet somehow frightening, the odd sounds only intensified the thundering pain so that Sedge thought he might go mad. By God, he was determined to see what it was he faced, despite his helplessness. Frustrated by the stygian blackness, he attempted to open his eyes. Ohhhhh. It was going to be more difficult than he had thought. He could almost wish he were dead, but, of course, he already was dead, so what was he to do? His head throbbing mercilessly, Sedge fluttered his eyes slowly open into the merest slits. Blast it all, the light was blinding! Oh, good Lord. Was it fire? The flames of hell? He groaned and snapped his eyes shut once again. His chest tightened as he breathed heavily, exhausted by the simple effort of opening his eyes. The thought briefly crossed his mind that dead men don’t breathe, but he dismissed it as simply a malicious illusion. Why me? What have I done to deserve this? This time, after very slowly cracking open one eye and then the other, he steeled himself to withstand the brightness, determined to see how bad the situation really was. Trembling with effort, he strained to keep his eyes open, blinking against the light. Everything was a bit fuzzy, but as he squinted he could make out a dark, looming shape surrounded by a fiery nimbus. Oh God. This was too much. He quickly closed his eyes again, not yet ready after all to face his own final judgment. The muffled sound of voices continued to assault his ears. Clamping his eyes tightly shut, he concentrated on the voices. No, not voices. Voice. One voice. Female, slightly musical, somehow soothing. Very, very slowly, he opened his eyes again. Blinking furiously, Sedge tried to bring the dark shape into focus. By God, he would face this thing. Allowing his eyes a moment to become accustomed to the almost painful brightness, the dark shape finally coalesced into a face—a hazy countenance only inches away from his own. Sedge forced his eyes to remain open, blinking frequently to ease the pain, and the intense brightness gradually faded into a more normal sort of light that eventually allowed him to see the face more clearly. It was the face … of an angel. Sedge gazed up at a vision of such dreamlike beauty as he had never seen. Before he could notice much more, his eyes fell shut again, this time of their own volition. He could not seem to keep them open. But one thing he knew for sure: that was no demon looking down on him. It was a lovely female face of creamy white skin surrounded by brilliant coppery curls and gazing down at him with huge sherry-colored eyes. She was an angel. Ha! He had been wrong all along. He was not in hell. He had ended up in heaven after all! He forced his stinging, uncooperative eyes open, for he must see her again, his angel. Head pounding furiously, he batted his lids against grainy, painful eyes and focused once again on the vision hovering above him, surrounded by light.